The importance of daily tooth brushing seems obvious. 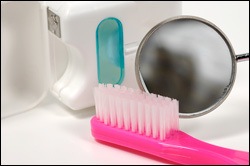 Unfortunately, daily brushing isn't very effective if you aren't doing it correctly. At The Dental Dimensions, we want all of our patients to be educated about the benefits of proper oral hygiene to ensure a lifetime of healthy, beautiful teeth. Proper brushing and flossing combined with a well-balanced diet play an important role in the prevention of tooth decay and gum disease. You should also visit our San Jose office regularly for professional cleanings and oral exams. We can help you determine what types of oral care products and techniques will be most effective for you and your family.